A key part of keeping rabbits, whether for livestock or for pets, is feeding them. It is no different for rabbits in colony housing – they also will not be able to feed themselves for very long. In any space with walls around it that is inhabited by rabbits, the green forage existing inside the boundaries of the rabbit colony will soon be exhausted. Eventually, it falls to human owners to ensure that their rabbits (both pets and livestock) are well nourished. And, if you’ve recently acquired a rabbit, knowing how to feed your rabbit might still feel like an unknown foreign language! “We found a pet rabbit on the road and took him home. We fed him a lot of lettuce and he ate the whole bowlful and drank lots of water. some noodles and some kind of nuts. Yes, some education is sorely needed! So, besides a desire to help the kind (but clueless) gentleman quoted above, we took several months to research ways to feed rabbits without pellets. We had already conducted a couple feeding experiments, which taught us a lot. 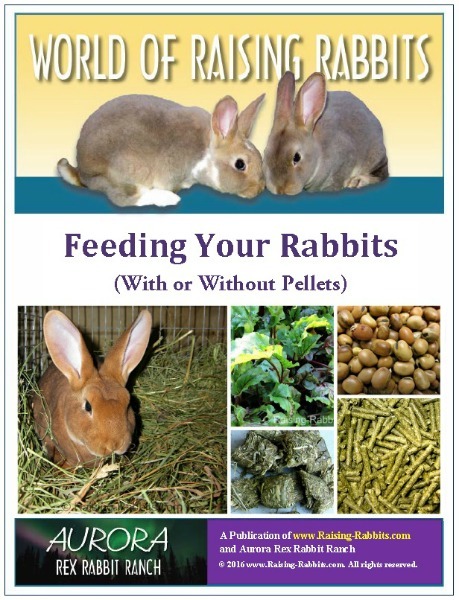 We did a lot more research, and then put all our findings in our e-book: Feeding Your Rabbits (with or without Pellets). Until February 20, get the Feeding Your Rabbits e-book at an introductory rate of 20% off – only $11.59! Get the whole scoop here; and purchase before February 20 for the best deal on Feeding Your Rabbits! We also have plans to provide "Feeding Your Rabbits" in book form. If you are particularly interested in obtaining a hard copy of this e-book rather than an electronic one (or both), please do let us know. “Recently I purchased the e-book on rabbit hutch construction. Brian also requested permission to use a couple of our copyrighted photos found in the e-book he purchased, Ideal DIY Rabbit Cages. 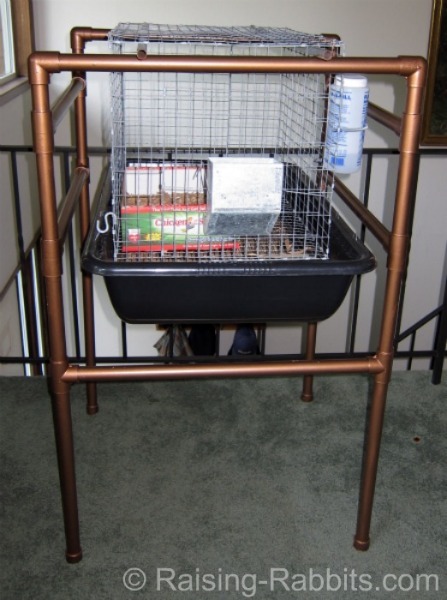 Below: One PVC hutch frame with a pet rabbit cage and deep drop pan suspended from the frame. Can be used inside or outside under a roof. This plan is available in Pet Rabbit Living Spaces e-book and also in Ideal DIY Rabbit Cages. ...Unless it is to get surprised by the gruesome sight. "Do rabbits eat their baby bunnies? 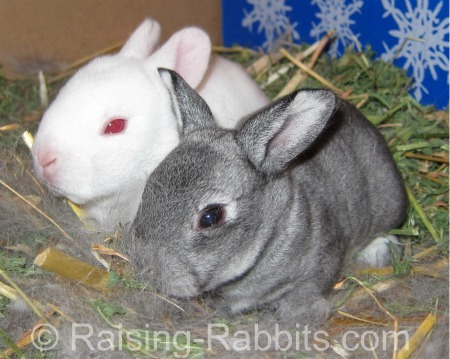 "My daughter's rabbit had only 3 kits that we know of and it was the doe's first litter. One kit we managed to get off her while she was eating it, the other she completely ate and we found one outside the nest in her outside cage. I have no idea why she did this but they were very big. She is fine now, but I wish I knew why this happened." Yes, that is one of the more difficult parts of the make-up of rabbits. Sometimes one never really knows. Repeating the breeding frequently results in complete success. But, the best way to help prevent cannibalism in the future is to ensure a nice quiet, non-threatening environment for a few days before, and also during the birthing process. You'll find much more info in our book, Rabbit Raising Problem Solver, or our e-book, Rabbit Reproduction. I hope the next delivery will be much more pleasant! As you know, Australia has had a very difficult time controlling the feral rabbit population, which continues to soar. 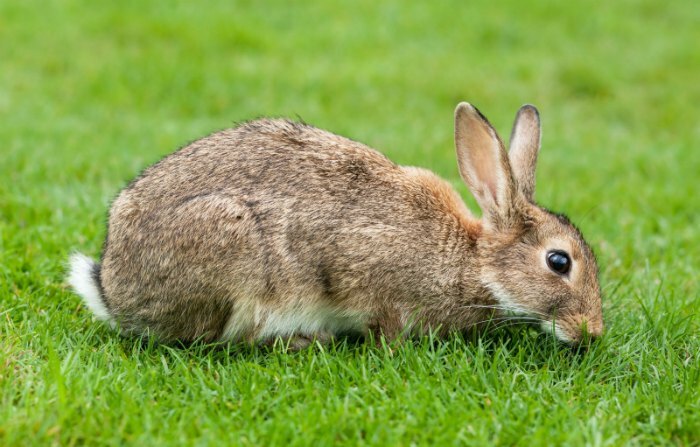 Two viral diseases have been unleashed on them over the last hundred years: myxomatosis and rabbit hemorrhagic disease (also known as calicivirus). These bio-attacks worked very well, but enough recovered or immune rabbits survived to replenish the feral rabbit population. Below: European wild rabbit, same species as domestic rabbits and Australian feral rabbits. Now that Australia is again losing $600 million every year to environmental destruction by rabbits, they are set to unleash another biological bomb on rabbits later this year. This will be a variant of the RHD virus known as K5 (from S. Korea). Unfortunately, I strongly doubt that three times will be a charm in Australia. There already exist 4 variants of RHDV in Australia that no longer seriously affect the feral population. These include a Chinese strain, RHDVa, found amongst the rabbits in NW Sydney, and a French strain, RHDV2. (It is not known how these variants came to be present in Australia.) Scientists are trying to determine the relationship of these new strains to current vaccinations for RHDV. The problem is: the virus is clearly able to mutate and adapt to the immune systems of rabbits. That vaccines confer only partial immunity (they stimulate antibodies but no cellular memory) may be contributing to the ability of the virus to mutate. K5 will be a fifth variant of the same calicivirus. There is no reason to believe it will do anything more than buy time for the Australian government to figure out some other way to destroy feral rabbits. A couple years ago I was contacted by New Zealand biology students doing research on how to control the New Zealand feral rabbit population. My advice was to utilize dedicated trapping and hunting, donating the rabbit meat to homeless shelters. Large ranching operations in New Zealand hire a rabbit trapper who does nothing but trap and kill the rabbits that eat the forages meant for sheep and cattle. If they don't, whole hillsides get denuded, with nothing left for livestock. Dedicated trapping and hunting is still my recommendation. Biological warfare will always have the same results – temporary, good-but-not-perfect success, and then a resurgence of animals with new and improved immunity to whatever agent was used. Perhaps if they add a second prong to their attack by increased hunting and trapping, they may actually achieve some success? Your friends at Raising-Rabbits.com wish you a wonderful February 2016.